Many people associate the caffeine in beverages and nonprescription dietary supplements with increased metabolism and weight loss. Coffee contains caffeine, which may cause a small, temporary boost in metabolism, according to the Center for Science in the Public Interest, or CSPI. But drinking coffee doesn't increase your metabolism enough to cause significant, long-term weight loss. Drinking coffee before bed is more likely to result in insomnia. Caffeine is an alkaloid that occurs naturally in coffee and cocoa beans, tea leaves and kola nuts. Depending on the strength of the coffee you drink, as well as the size of your cup, coffee drinks can impart anywhere between 40 to more than 300 mg of caffeine, according to CSPI data. 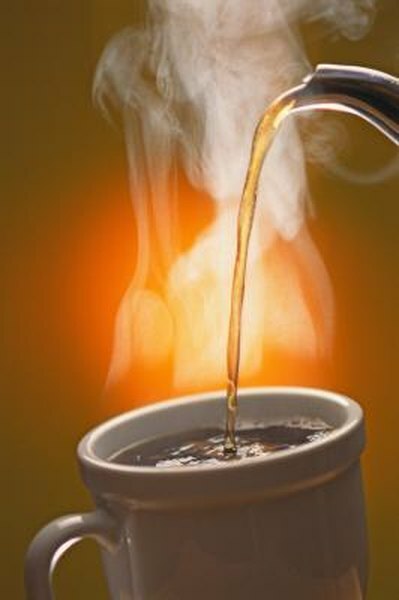 The average cup of brewed coffee can have anywhere between 102 and 200 mg caffeine. Caffeine does affect your metabolism, states MedlinePlus, primarily by exerting its effects on your central nervous system. A strong cup of coffee can make you feel more awake, alert and energetic. However, if you're using caffeine to lose weight, you may not get the results you want. The CSPI indicates that 100 mg of caffeine can increase your metabolism by 5 percent in one day. This may help you burn between 75 to 110 calories. Double your caffeine intake and you also double the increase in metabolism. There may be other ways that caffeine can help to reduce weight. Some people notice that coffee has a diuretic effect; this won't reduce body fat, but it may decrease water weight, the FDA.gov notes. Caffeine may also act as a temporary appetite suppressant. A large study conducted by the Harvard School of Public Health published in the March 2006 issue of "The American Journal of Clinical Nutrition" suggests that caffeine consumption may be linked to negligible amounts of long-term weight loss in some men and women. Harvard researchers examined the effects of caffeine intake on 18,417 men and 39,740 women over the course of 12 years. Researchers discovered that study participants who increased their caffeine intake were more likely to lose a small amount of weight compared to those who decreased their caffeine intake. However, the amount of weight loss noted was very small — around 0.9 lbs for both men and women. Researchers discovered that certain populations of caffeine users tended to exhibit weight loss: younger men; women with a body mass index of 25 or more; women who smoked; or women who were sedentary. The CSPI indicates that there are various reasons caffeine might not give you the results you want. Your body adapts to the amount of caffeine you get from coffee and other caffeinated beverages and foods, decreasing its effects on your body. Additionally, the CSPI proposes that some caffeine users tend to eat more calories to replace the calories they burned through caffeine use. Many coffee drinks such as flavored lattes have a very high number of calories that come from added sugar and fat. Zeratsky states that consuming gourmet coffee drinks may cause you to put on weight rather than lose it. Drinking coffee before bed may put you at a disadvantage if you want to get restful sleep. Caffeine has many adverse effects, states the Linus Pauling Institute, including a rapid heart rate, tremors, anxiety and insomnia. Caffeine can also upset your stomach and cause nausea, vomiting and diarrhea. You may also feel the need to urinate often. Consuming 200 to 300 mg of caffeine during the day — between 2 and 4 cups — isn't likely to be harmful. FDA.gov advises that you refrain from drinking coffee and other caffeinated beverages in the evening so you'll get restful sleep.